Two size options - 74" x 87" or 87" x 101"
We designed this quilt for our Mystery #52. It's now available as a complete pattern. The floating Sawtooth Stars made with "connector corners" assure sharp points on your stars. The checkerboard sections created in the sashing make for a fun overall design. We suggest using half-square triangle paper for the Background triangles at the corners of the star blocks. Alternate instructions are given if you prefer not to use triangle paper. The small quilt uses 15 Assorted Prints plus 2 Backgrounds. 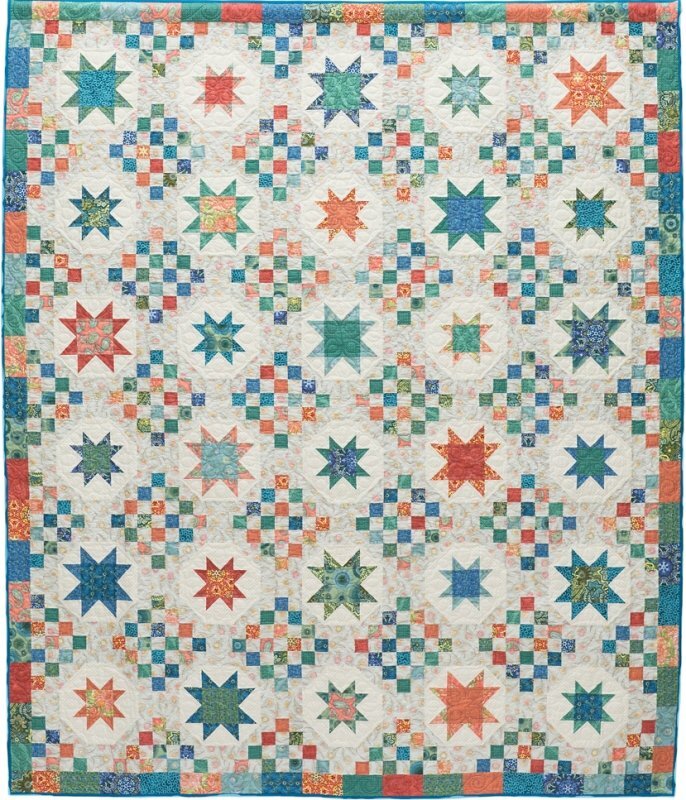 The large quilt uses 20 Assorted Prints plus 2 Backgrounds. The pattern also includes numbers for "cutting from your stash" instead of using the suggested yardage.